These are a very quick knit. I made the Child’s Small size and I’d guess each mitten took a couple of hours to make, including the seaming. This pattern probably won’t work very well with a 100% acrylic yarn. You really need to block the finished mittens aggressively to wind up with a mitten-shaped object. Plymouth Encore took the blocking well, but other acrylic yarns might not. Right off the needles, the mittens are vaguely fish- or submarine-shaped, tapering to a point at the fingertips and the thumb sticking straight out at a very un-thumblike angle. The pattern can be easily converted to knitting in the round, although you’ll probably want to employ some sort of jogless jog technique. Having a model with small hands and opposable thumbs greatly increases the charm of the finished mittens. Startitis: I’ll beat it yet! CogKnition posted this on September 4th, 2006 @ 4:54pm in Baby Items, Finished Objects, Hats & Mittens | Permalink to "Target Wave Mittens"
They’re cute! I just made a pair in a different acrylic (Red Heart Soft) and they started looking more like mittens after my daughter wore them around for a while. 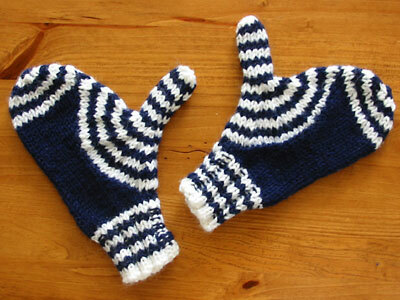 lovely mittens – did you find any errors in the pattern? I’m up to ‘shape fingertip target’ and think that it should be RS, not WS.